Our firm is deeply committed to customer's satisfaction and therefore offers the finest quality Color Sorter Machines to our valuable customers. Manufactured using supreme class components in complete conformity with predefined industry norms, this sorter is designed with utmost precision by our technical experts. Our provided sorter is extensively demanded in food processing unit and used for removing impurities from grains. This sorter can be availed from us in both specific and customized options as per the need of the clients. We offer this Color Sorter Machines at market leading price to the clients. Through its impeccable range of color sorters, just in three years, mark become the most trusted and preferred color sorter among the millers for its sorting accuracy, multiple commodity handling and reliability, smart offers cost effective color sorter in highest technology standard. Adopting the latest technological advancements, implementing our innovative ideas and taking consideration of our customer's feed backs. 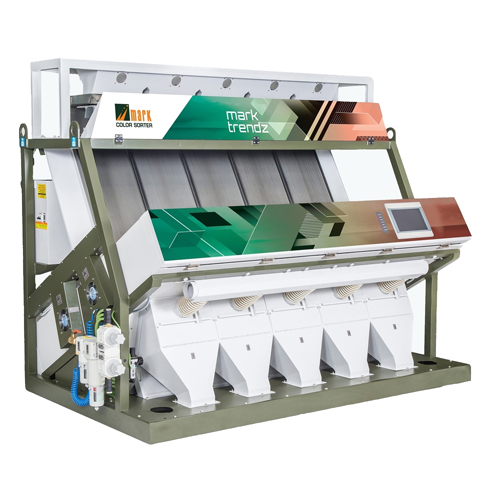 mark come out with new range of color sorters aimed at wide variety of grain processing , Dhal, Rice, Cereals,Nuts, Grams, Pulses, Beans, Coffee, Tea, Seeds, etc. Our Color sorter uses high resolution ccd scanner camera and double side view to give cleanest output. Fast switching high life ejector valves and high precision nozzles and chute give great accuracy in sorting. Power of Double Side View. We are offer different model name of color sorter machine.